1995. Harper. Paperback. 519 pages. This is the story of the Wicked Witch of the West (real name: Elphaba) from her infancy to her fateful meeting with Dorothy. It took me a little time to get into the book Wicked. After the prologue, the book starts with Elphaba’s parents and follows their perspective as they regard their literally green, ferocious infant. Her parents are short-sighted and not very likable. In addition, the world that Maguire created in his book Wicked is very dark. Murder, exploitation, and overall callousness rule the day. The world remains dark throughout Wicked, but my enjoyment of the book increased while reading Elphaba’s story when she is a college student at Shiz University. It is there that she meets Galinda (known later as Glinda) as well as some other pivotal characters. The section that takes place at the university was definitely my favorite part of the book. I was the most invested in the book at that point, as the characters navigate customs, and strike up unusual friendships, and debate the issues of their world. Also, several students engage in stealth research. 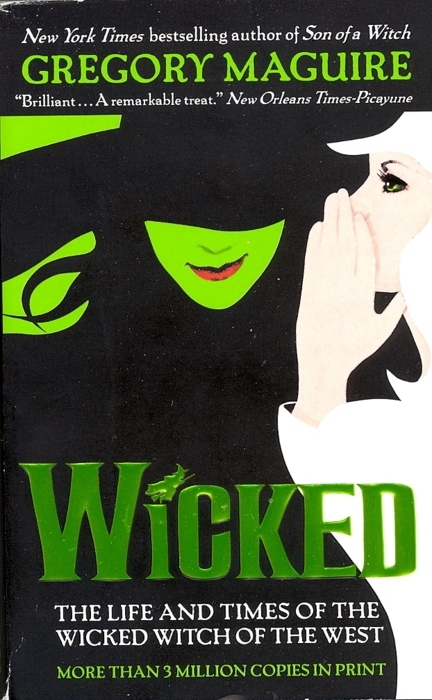 The university section of the book is also where Wicked shines most strongly in its depictions of its female characters. It made me think of what is popularly known as the Alison Bechdel test (which was actually created by Bechdel’s friend Liz Wallace) which is primarily applied to tv shows and films, looking for those where 1. there are at least two female characters 2. who talk to each other 3. about something besides a man. So I thought of this test as I read the female characters in Wicked talking about theology and other matters to each other. After a fateful journey to Oz to see the Wizard, Elphaba’s path diverges from the university and her family and her friends, and sees her to far-off corners of the land. It gets pretty bleak and there’s a part about a boy in a well that was like the epitome of the bleakness for me, although there were other moments in contention. It made me nostalgic for the university section, which was by no means rosy. I didn’t quite buy into the intensity of Elphaba’s desire for her sister’s ruby slippers which unfortunately is the driving force of Elphaba’s story in the last act. Still, I plan on reading more in the series to discover what else is in store for the remaining characters, as a lot was left unresolved in the broader story of Wicked. Also, Gregory Maguire’s world-buildingwas excellent and I’d like to see where he’s going with it. I’ve never seen the Broadway show, though I occasionally asked my roommate who has seen it, if such-and-such was in the musical or not. I’ve heard the ending is really different. Stuff As Dreams Are Made On – Wicked does something genius. Gregory Maguire takes a character that’s come to represent pure evil in our culture and makes us question that. 2009. McSweeney’s. Hardcover. 342 pages. 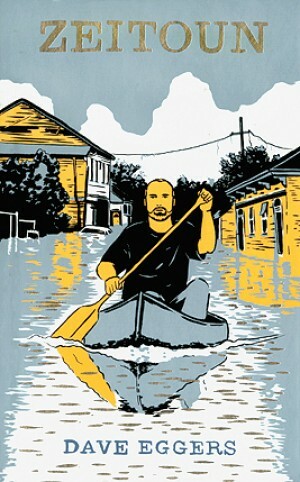 In this non-fiction book that reads like a novel, Eggers tells the story of the Zeitoun family’s ordeal in the aftermath of Hurricane Katrina. Abdulrahman and Kathy Zeitoun run a painting contracting business in New Orleans. Abdulrahman (known as Zeitoun), was originally from Syria, had married Kathy, an American convert to Islam, and settled down in New Orleans in 1994. When Hurricane Katrina is forecast to hit the city, Kathy takes their kids away to stay with her family elsewhere in the state. But Zeitoun stays behind to look after their home and rental properties. Zeitoun started off gradually, introducing the reader to the family at its center. Eggers continued to intersperse backstory throughout the progression of the hurricane narrative. I enjoyed reading the stories of Zeitoun’s life. His family lived by the sea in Syria; his brother Mohamed was a champion long-distance ocean swimmer, a hero for Syria, but who died young in a car accident. Zeitoun took jobs on ships that took him all over the world until he finally fetched up in New Orleans. There he was introduced to and married Kathy, an American who had converted to Islam to the bewilderment of her family. She had one son from a previous marriage, and she and Zeitoun had four more. They knew people all over their city through their respected and successful business. When I watched the news footage of Hurricane Katrina as it happened back in 2005, it was the angriest I had ever been in my life about something not personally happening to me. I usually cannot sustain a high level of anger for long, but I was furious for days over this. Zeitoun brought me right back to that level, especially because I hadn’t really known about stories like Zeitoun’s. He and three other men were picked up at his rental property by armed police and National Guardsmen as suspected looters and taken to a makeshift outside prison at the Greyhound station. Zeitoun was almost immediately treated like he was a terrorist. He was repeatedly denied a phone call and medical attention, and was humiliated, taunted, and mistreated. The other men were also subjected to this treatment (along with hundreds more who were held in Camp Greyhound). Zeitoun was held for almost a month, and for most of that time his wife Kathy had no idea what had happened to him and feared that he was dead. I couldn’t bear to put Zeitoun down as I raced toward the end, staying up later than I should have to finish it. I think I didn’t quite register the epilogue part of the book, because I was still reeling from the injustice of Zeitoun’s ordeal. My roommate vicariously experienced the book as I vented to her that night about the story and about Hurricane Katrina in general. I woke up the next morning still thinking about it. 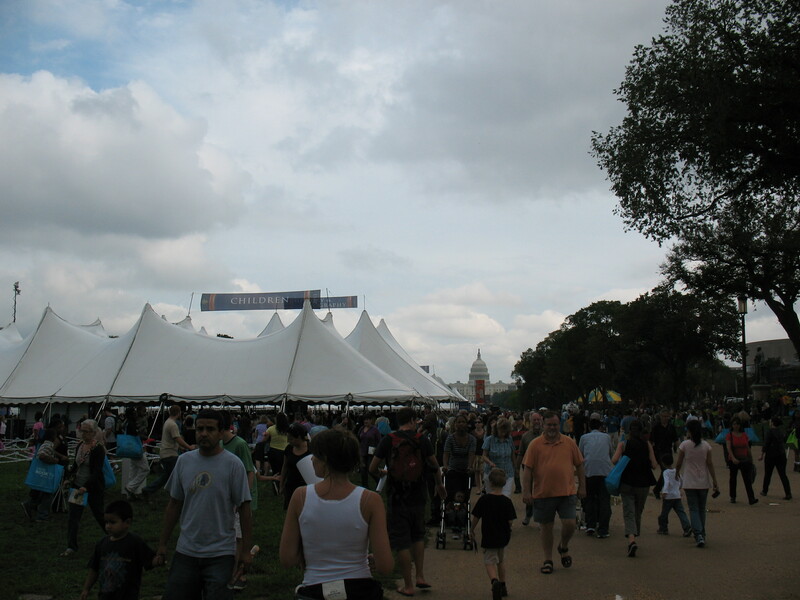 I mentioned in my recap of the National Book Festival a quote from Gregory Maguire where he said we have a “moral need to take our time to decide who is good and who is bad.” That is exactly what did not happen for Zeitoun and for others held at Camp Greyhound. On the basis of one officer’s mistaken identification of him as a looter, Zeitoun was branded as “bad” and handed off to other authorities, who carried that assumption further, and handed him off to different authorities who were so far divorced from the original circumstances of his arrest that they just fell into the simplistic equation of incarcerated = bad, Muslim = terrorist and wouldn’t hear of anything otherwise. I admire Abdulrahman and Kathy Zeitoun for letting their story be told by Dave Eggers. They opened up their lives to us, the readers, and that is a brave thing to do. Writing this review, I’m reminded of another couple’s story from the Ninth Ward in New Orleans, Scott and Kimberly Rivers Roberts. Their story was told in the documentary Trouble the Water and if you watch it, I recommend watching their Q&A with film audiences in the special features. I’m so glad I read Zeitoun, but I had to make a pledge after reading this book not to read another nonfiction book about upsetting subjects for the rest of the year. I have read several emotional heavy-hitters this year: And the Band Played On (AIDS), Safe Area Goradze (”ethnic cleansing’ in Bosnia), We Wish to Inform You… (Rwandan genocide). After reading Zeitoun, I realized that I do have an emotional limit when it comes to my reading material, and that I need to take a break for a while. 1997. Avon Books. Paperback. 290 pages. This is the first novel in Lippman’s Tess Monaghan series. Tess Monaghan used to be a reporter, before the Baltimore paper she worked for went under. Unemployed, she works part-time at her aunt’s bookstore and keeps up a rowing routine in the morning. When a rowing buddy offers to pay her to follow his fiancee, who has been acting weird, Tess accepts. But when the fiancee’s boss, a lawyer with the reputation of defending the worst criminals, turns up dead, Tess finds herself out of her depth. 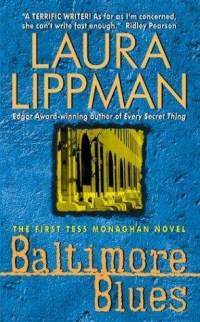 I’ve had Laura Lippman’s Baltimore-set mysteries on my radar for some time, but knowing she would be at the National Book Festival, I pushed the first book of her Tess Monaghan series to the top of my reading list. Although Baltimore is not far away from me, I have not visited it often, so I can’t vouch for the accuracy of Lippman’s depiction. But the setting is a huge part of this mystery, and I do have a penchant for mysteries that thoroughly burrow into their surroundings. When I first started reading the book, I was wary of some of the details included. For instance, I didn’t like that Tess’ aunt had a quirky bookstore, because I doubted its ability to stay solvent, and also why can’t characters and their relatives have more run-of-the-mill establishments? Why must they always be quirky and successful? I digress. I also didn’t like that the rowing buddy’s fiancee was a flawlessly beautiful, put-together bitchy woman in a high-status job, a character made even more stereotyped by being contrasted with our more grubby, down-on-her-luck protagonist. But the book did start winning me over with the story nonetheless. Lippman definitely was good with misdirections and red herrings, and mysteries that may be linked to other mysteries. I also liked that Tess showed how new she was to the game of investigating. She makes messes, says the wrong things, gets chastised by others for the previous. She has to try and figure out the right thing to do in gray situations. There have been a number of mystery/thriller series that I have started but never proceeded further. I think that I will be more active in seeking out the second of this series, because – based partly on Lippman’s talk at the Book Festival – I think Tess will continue to evolve as an interesting character, and I think Lippman will serve up some nice, twisty mysteries for Tess to investigate. 2005. Houghton Mifflin. Hardcover. 467 pages. “Never doubt,” said Margaret Mead, “that a small group of thoughtful, committed citizens can change the world. Indeed, it is the only thing that ever has.” This book is about one such group. Their story is not a simple one, but a ragged and untidy epic that did not unfold in the orderly way they hoped for. It would sprawl across decades and continents . . . It would become interwoven with great historical currents which . . . no one foresaw: above all the dreams of equality unleashed by the French Revolution, and a series of ever-larger slave revolts that shook the British Empire and made clear that if the slaves were not emancipated they might well free themselves. The stage on which British slavery lived and at last died was a vast one. Bury the Chains is an ambitious history of the British anti-slave trade and anti-slavery movement (I separate because it was first the one and then the other.) Hochschild does an excellent job of making sure that readers see the big picture while including the kinds of detailed primary-source tidbits that make history come alive. If this history could be said to have a central figure, it is that of Thomas Clarkson. While a University student, Clarkson won an award for his Latin essay in response to the question: is it lawful to make slaves of others against their will? The horrors he uncovered while researching the question changed him irreversibly. As Clarkson wrote later, “a thought came into my mind, that if the contents of the Essay were true, it was time some person should see these calamities to their end” (qtd. on p. 89). And so throughout his life, Clarkson agitated against the slave trade and against slavery, riding throughout the country to gather testimonies of the horror, and to gather support. I was a little familiar with Thomas Clarkson as he was played by Rufus Sewell in the film Amazing Grace, but Hochshild’s book has placed him into ‘hero’ category for me now. He spends his whole life fighting for the cause. There’s a detail about Clarkson’s funeral that was extremely touching and there might have been some tears from me at that point. While a clear admirer of Thomas Clarkson, Hochschild is definitely a warts-and-all writer of history. Clarkson is pretty much made of awesome, but even he has his blind spots. Even the venerable William Wilberforce suffers a little under close scrutiny. For example, Wilberforce was disgruntled with the women’s antislavery societies because he thought their behavior was stepping outside the bounds of the biblical role for women. Paternalism was another frequent folly of the white abolitionists. I loved that Hochschild does not assume a person’s importance to the cause can be determined by how much was written about them at the time. When Hochschild mentions a female leader of a Barbados revolt, Nanny Grigg, he points out that “as both slave and woman, Nanny Grigg is doubly written out of history, and we know nothing else about her except that she was carried on the inventory of the Simmons plantation at the exceptionally high value of 130 pounds” (p. 319). Similarly, one prominent leader in the “end slavery now” movement was a Quaker convert, Elizabeth Heyrick, an active anti-slavery writer and campaigner. Little is known about her personal life, but Hochschild makes sure to give her credit for keeping the cause alive. One final set of grim numbers underlines the way slaves on sugar plantations like Codrington were systematically worked to an early death. When slavery ended in the United States, some 400,000 slaves imported over the centuries had grown to a population of nearly four million. When it ended in the British West Indies, total slave imports of two million left a surviving slave population of only about 670,000. The tiny French island of Martinique took in more slave imports over the years than all thirteen North American colonies, later states, put together. The Caribbean was a slaughterhouse. I could go on and on about this book, sharing anecdotes and facts, but I really hope my review will encourage others to read it for themselves. It will definitely be one of my favorite books of the year. It also is quite resonant with today’s times, when “preserving the economy” seems to be given too freely as the ‘ultimate’ justification. That definitely gives food for thought. My main draw on the second day was Joel Achenbach, Washington Post staff writer and author of A Hole at the Bottom of the Sea, which I reviewed last month on my blog. That book is about the BP Oil Spill of 2010. At his Festival talk, Achenbach described reading through a handbook of petroleum engineering bit by bit, just to familiarize himself with the terms. Deepwater drilling is a new frontier for our technological society, and what BP was doing before the Deepwater Horizon disaster – temporarily abandoning a deepwater drill – had been done only a few times before. When reading A Hole at the Bottom of the Sea, I had surmised that Achenbach had written the book quickly, given the recency of the events and the April 2011 publication date. At the Festival, Achenbach confirmed that he wrote it in a “mad frenzy” so that it would come out by the anniversary of the Macondo well blowout. In his talk, Achenbach reiterated the themes from his book, such as the vulnerabilities of our technological society. I liked how pragmatic he was about the oil industry. He said, one thing to keep in mind is that we the public have no idea how big the oil industry really is – it’s bigger than you think. In addition, we should realize that the oil industry is not something the U.S. controls. Achenbach also pointed out that the industry is so big and global, that they are not that perturbed by regulations we pass, as they have the whole world to drill in. As to the question, should we deepwater drill, the answer is “we’re going to.” We’re all complicit in the oil drilling industry if we drive. As a lover of non-fiction books, I liked when Achenbach said “I think people should be more familiar with the society we live in. Read books. Learn the language.” This is good encouragement for me to read more science and technology books. I saw Neal Stephenson next. I had looked him up before the Festival, when I was checking out the roster of featured authors. Stephenson writes massive cyberpunk/sci-fi/speculative fiction tomes. I was intrigued by this, although I had never heard of him before. Stephenson read an excerpt from his recent novel, Reamde, which is a 1056-page thriller involving a multi-player online game. At times, the technological detail in the excerpt he read was not compelling to me, but at other times, it was quite funny and spot-on about human relationships with technology. I’m not sure if his books are for me, and their size is definitely daunting. I was happy when an audience member asked Mukherjee about the authors or books that he admired. He mentioned Richard Rhodes’ The Making of the Atomic Bomb, Rachel Carson’s Silent Spring, Michael Pollan and Susan Sontag’s Illness is a Metaphor. I own Carson’s book but haven’t read it and I own and have read one of Pollan’s books, but I may have to look into the other two. So that was my Festival experience!